SanDisk has launched a new range of solid-state drives, which the company is specifically marketing as a cost effective solution for users on a budget who would be better off upgrading their current machine than purchasing a new one. The SanDisk Ultra SSD family is available in 60GB, 120GB and 240GB sizes with MSRPs of $130, $220 and $450, respectively. With those prices SanDisk isn't really breaking any affordability records, but Newegg.com is already selling the 120GB variant some $40 cheaper than its suggested retail price, making it a more competitive alternative next to the likes of OCZ's last-generation Vertex 2 and Agility 2. In terms of performance SanDisk promises 280MB/s reads coupled with 270MB/s write speeds over the SATA II (3Gbps) interface. The Ultra SSD is based on multi-level cell (MLC) NAND flash memory and has a mean time between failure (MTBF) rate of up to one million hours. SanDisk is also touting the drive's low power consumption, though they didn't share any specifics, nor do they mention which SSD controller is powering these devices. 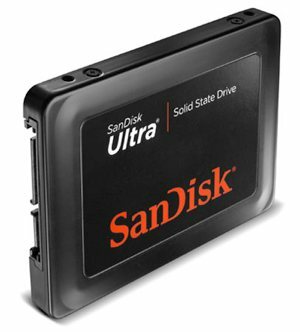 In any case, although the Ultra SSD is certainly not the fastest solid-state drive out there and it doesn't carry the latest SATA III (6Gbps) interface, it could be worthy contender in the budget segment if SanDisk can keep the prices down.